Advancing your business career in this job market can be a challenge. According to a Business Week poll, only 38% of senior business majors reported having a job offer in January. That compares with 46% in 2009 and 56% in 2008. New jobs figures indicate that the national unemployment rate has risen from 9.6% to 9.8% and this rate has been over 9% for 19 consecutive months. Many business students are looking into advanced degrees like an MBA. "There's the idea that when the economy is lagging and jobs are scarce that you can hideout in business school for a few years," says David Ingber, the faculty manager at Knewton GMAT prep. "Having an MBA can make your resumé pop out to employers or make you eligible for a promotion within your company. "Taking the plunge to go back to school is a huge financial commitment. The average cost of business school tuition is $100,000. That figure does not include cost of living, time out of the workforce or additional interest from deferred undergraduate loans. However, the payoff also can be huge, with MBA's from top schools earning between $100,000 and $200,000 per year. 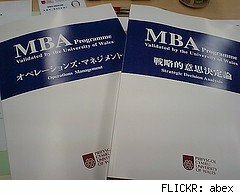 How can you calculate the value of an MBA to you? "It's very difficult to calculate, says Ingber, "It depends on the person you are and can depend on the school you go to." Marketing yourself can be key to maximizing the value of your degree. "Schools want to be diverse ethnically, geographically and with student interests," says Ingber, "A strong applicant is someone who can bring something new to the table." How you present yourself during the application process also is extremely important, especially in the age of the Internet. "Everyone has an online persona at this point," says Ingber. "You want to be very aware of everything you are putting out there, because everything can be immediately verified." Choosing the right school also can help maximize the value of your MBA. "Business schools have different networks--some local, some global," he said. "People go to schools for the networking portion because knowing more people in business can be really good for you." Think business school is the right move for your career? Dust off your brilliant business idea, hide your drunken college photos and network your way to success. The second round of business school admission deadlines are coming up in January.